We add Sunningdale to our Alpha Picks, whilst removing Bumitama and Duty Free. Sunningdale’s solid cash flow, M&A potential and undemanding valuation are attractive. SMM has also been added as a candidate for topslice/short after its recent price surge. 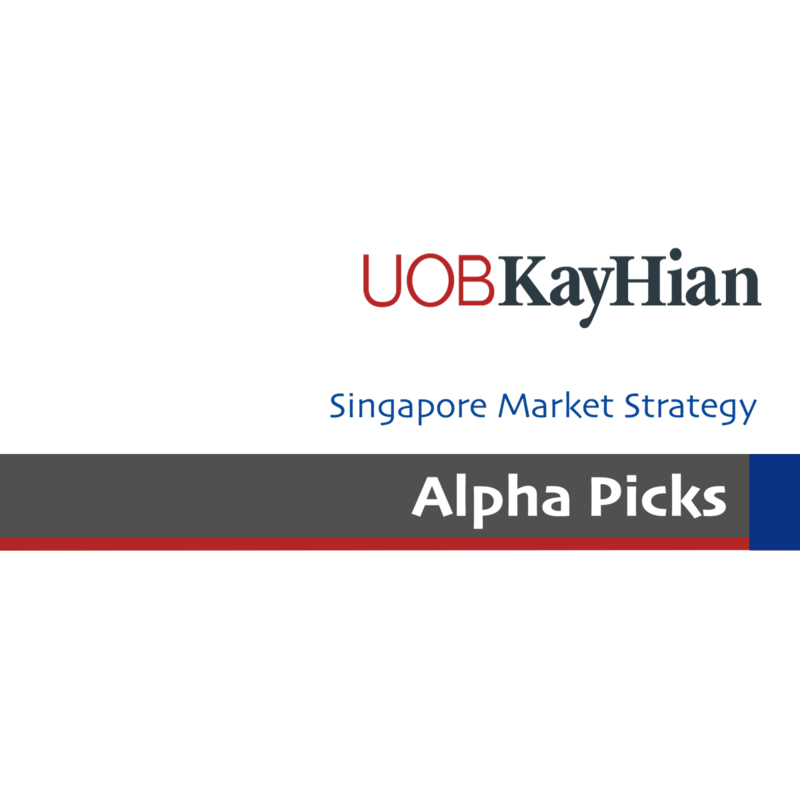 Our Alpha Picks had a mixed performance in February. Food Empire outperformed (+9.6%) after its good 4Q16 results and the announcement of a final dividend. However, Bumitama, Duty Free (DFI) and CAO retreated by 1.7- 3.7%, despite Bumitama’s and CAO’s solid results. We remove Bumitama as the stock has returned 8.3% since its inclusion into our Alpha Picks in Sep 16. Duty Free International (DFI) has also been taken out given the lack of near-term catalysts after the announcement of its bonus warrants issue (2 bonus warrants for every 5 ordinary shares). Adding in a new pick to BUY and one to topslice. We introduce Sunningdale into our Alpha Picks after our BUY initiation with a target price of S$1.83. We remain believers in China Aviation Oil (CAO) and Food Empire as CAO will continue to benefit from the robust growth in China’s civil aviation industry and the global aviation industry, whereas Food Empire is an inexpensive consumer proxy for Russia and Ukraine. Sembcorp Marine (SMM) (HOLD rating) is a candidate for investors to topslice or short after its 47% ytd rise, which we believe is not justified by its fundamentals. Benefits from an oil price contango environment as they are able to buy oil immediately at a lower price while arranging for deliveries at a later date and higher prices. China Aviation Oil (CAO) is APAC’s largest physical jet fuel trader, and holds a monopoly in supplying imported jet fuel to the whole of China, making it a proxy to China’s global aviation boom. Event: A steeper jet fuel future contango market will likely enhance trading profits. Any M&A announcements on earnings-accretive fuel assets will also likely result in share price reviews. Whilst we have an official HOLD rating (Under Review), we think the recent share price surge is an opportunity to topslice (the stock has risen 47% ytd). Although earnings appear to have bottomed out, the lack of contract wins is worrisome. If no order wins are secured soon, 2017 earnings will start feeling the impact of the low 2016 contract win as the orderbook depletes. Target price of S$1.61, based on 1.2x 2017F P/B, derived on a P/B vs ROE relationship for large-cap shipyards. Event: Lack of orderbook wins or weaker-than-expected 1Q17F. Timeline: Adhoc announcements of new orderbook wins. Sunningdale operates in 10 countries, making it a truly global force in the plastics industry. It is one of the top global players with production facilities spread across the globe, allowing for better proximity to customers. The precision engineering segment has high entry barriers due to the technical knowhow involved. Also, the segment requires intensive capital investment and large reinvestment needed to keep up with new developments in a constantly evolving industry. Long lead time before entrants are qualified and multi-year contract awards make for high customer stickiness. With the recent M&As for precision engineering firms with substantial automotive exposure (Spindex and Innovalues), Sunningdale is the only large precision plastic player left on the SGX that fits the bill. We have PE-based target price of S$1.83. Event: Stronger-than-expected earnings growth. Any M&A deals for other precision engineering firms that boost the capabilities of Sunningdale or privatisation announcements. Timeline: Potential M&A acquisition deals or privatisation announcements in the next 6- 12 months. Food Empire is the dominant coffee mix market leader in Eastern Europe with a market share of more than 50% in Russia and more than 40% in Ukraine. The company has raised prices in excess of local inflation over the last few years, which demonstrates its immense pricing power in its core Eastern European markets. With a stable Russian rouble and potential for Russian sanctions relief from the new US President Donald Trump, we expect a strong sustainable rebound in net profit for FY17. Event: Sustained earnings growth momentum in FY17F and further share purchases by its CEO.